Bob Culbertson has been one of the most well known solo Stick performers ever since he started with the instrument back in 1976. Forced to watch Emmett demo the instrument instead of taking a day off at the beach, Bob has called the Stick his main instrument ever since. With over 80,000 CDs sold, he is one of the most popular and influential performers on the instrument today. 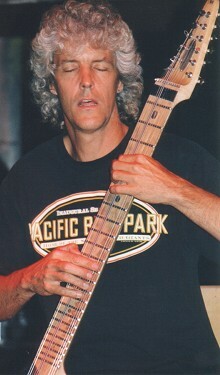 In addition to his recording and performance credits, Bob created a series of video tapes called Lessons on the Stick which are available from Stick Enterprises and are considered a "must have" for any Stick player. In these tapes, Bob clearly demonstrates the same series of lessons that are also documented on his web site plus much more. Having taught over 100 students in his career, Bob has also taught at several Stick seminars all over the world. Bob will be teaching at the 2002 Midwest Stick Seminar in Ann Arbor, Michigan in August and will be performing all over the country in August and September. For the latest installment of "Talking Sticks" featuring an interview with Bob Culbertson, click here. For more information on Bob, his lessons, his recordings, and his upcoming schedule, visit his website at www.stickmusic.com. To find out about the collection of Bob's CDs available from Stick Enterprises, click here.